iTunes - CIS 4372 HCI and Data Viz. iTunes is a free application for Mac and PC. It plays all your digital music and video. It syncs content to your iPod, iPhone, and Apple TV. And you can add to your collection anytime. iTunes is one of the most favored media players because of its universality with different media types as well as its very successful iTunes store. 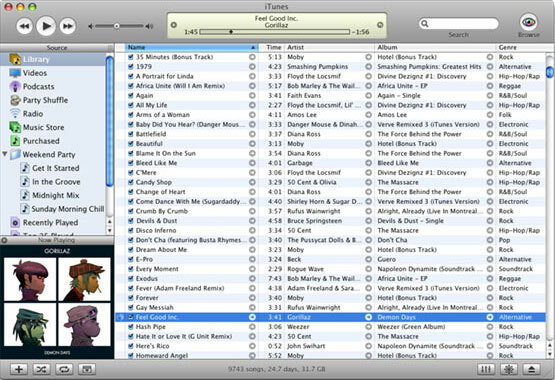 ITunes has revolutionized the way we buy, store, and organize our personal music collections. You can find and buy almost any song ever written, download the latest season of your favorite TV show, or listen to a podcast about just about anything. Leave it on your desktop or take it with you anywhere with an IPod. Your entire library can transfer to one with just a drag and drop. Rule 1 received a 5 for the total appearance and the fact that you can control 90% of the program just by flipping between the sections in the left column. Rule 2 got a 5 because you can be interested in different things, like music, videos, or podcasts, and use the same program for all of them. Rule 3 received a 4 for having useful “are you sure?” dialog boxes. Rule 4 got a 4 for standard procedures when adding songs to the library. Rule 5 received a 4 due to the same dialog boxes mentioned in Rule 3, but Rule 6 received a 3 because you can’t undo deleting a song or playlist. Rule 7 got a 4 for letting rule your own musical kingdom. Rule 8 received a 5 for being just sheer simple to use all of its features.